How can I keep that in my thoughts? How do I keep that focus? As a homeschool mom, I see two clear strategies that can assist me in staying focused on our goals. The first way, and probably most obvious, is to personally stay close to the Good Shepherd. I need to make sure I am making time to meet with the Lord a priority. Am I reading my Bible each day and meditating on what He says through His Word? Am I taking time to pray and listen from my Savior? Am I leaning on Christ and letting Him direct my thinking, words, activities, and day to day? If I neglect this most important relationship, my vision begins to wane and I can gradually lose the focus of ‘love for God, love for His Word, love for others, and love for learning’ – turning it completely to academics and the stress of trying to do more and more, and entirely missing the heart. How do I know this? Well, sadly, it is because it has happened frequently to me along this homeschool journey. I need a constant reminder to sit quietly and rest, to lean on the One who has called me to this journey, and to abide in His Word. A second way to attempt to stay focused is to incorporate more of God’s Word and learning through using the Bible during our school days. When choosing curriculum, I try to look for (or create) resources that are founded on and transmit a biblical worldview. during these short years we have been given with each of our children. Some academic areas are easier than others to find materials that meet that criteria. For example, we have discovered numerous science and history curricula that integrate the Bible and subject matter quite well. Other areas, however, seem to be lacking and seem much more difficult to integrate. Can aspects of language arts be taught using the Bible? Yes! One example is teaching spelling skills, handwriting, capitalization, spacing, and punctuation using verses of Scripture. 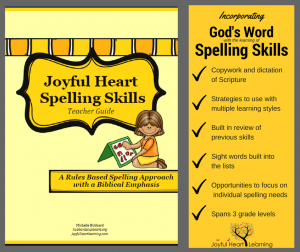 Joyful Heart Spelling Skills uses this method and was developed from a desire to incorporate God’s Word with the learning of spelling skills for early elementary students. Joyful Heart Spelling Skills focuses on 73 spelling rules, starting with three letter CVC words and gradually builds and progresses with more difficult skills. Each spelling skill is practiced during the duration of the skill focus through use of copywork, dictation, word sorting, building words, color writing, and a variety of hands on suggestions for forming words using a different medium or practicing the skill in a more hands on way. Teaching spelling in this manner allows us to gain one more time during the day in which we can intentionally set His Word before our eyes, write it, think about it, and talk about it – enabling us to learn both academically and spiritually. 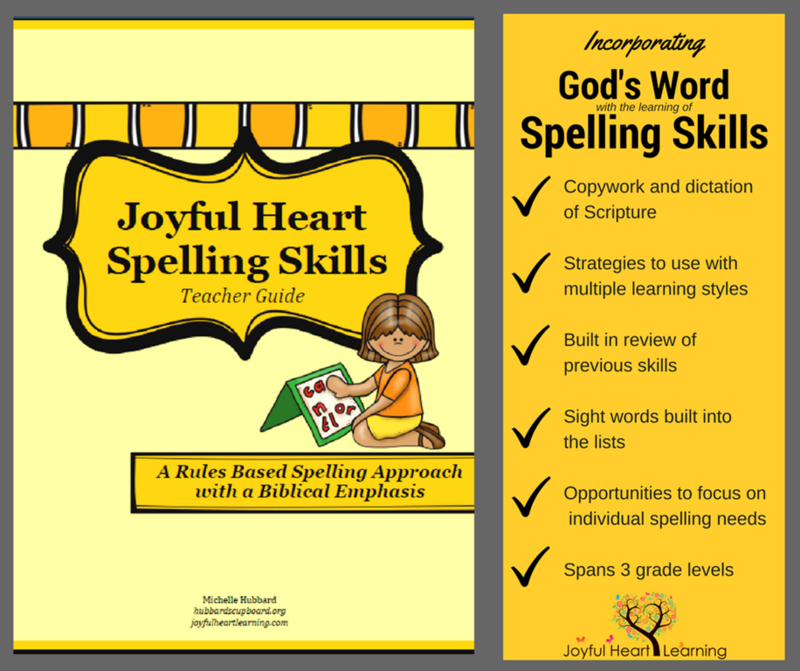 Want More Information about Joyful Heart Spelling Skills? 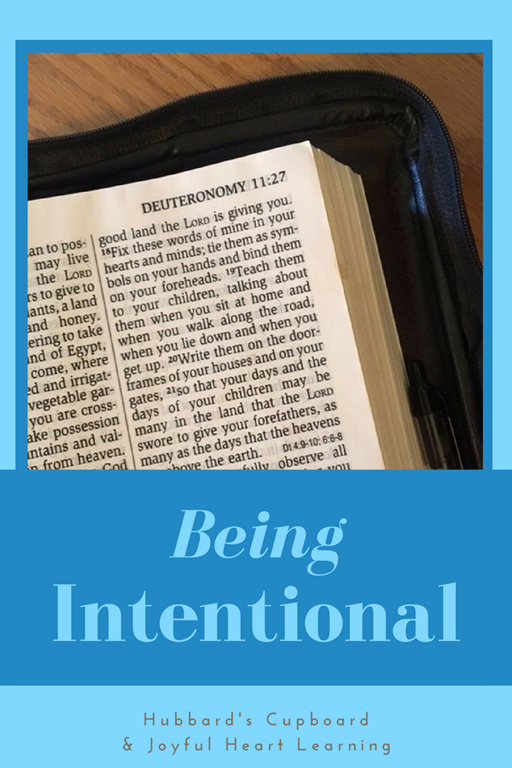 To succeed in keeping our focus and vision before us involves being intentional. Staying close to Christ and in His Word as well as utilizing resources with a biblical emphasis can help us stay the course – instilling a love for God, a love for His Word, a love for others, and a love for learning.